This time there will be no camping. Welcome back. 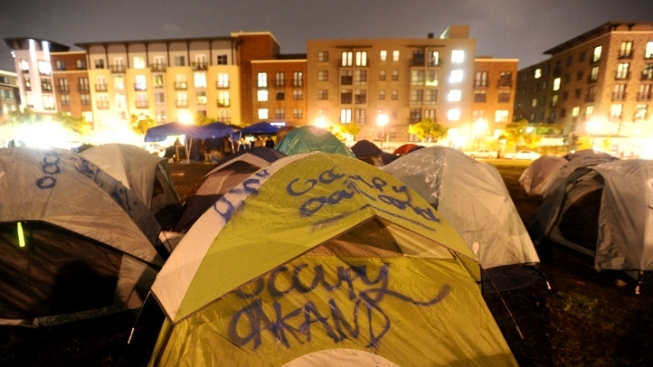 Occupy Oakland is planning to move bakc in. Whose plaza? Their plaza, apparently. There was never less than a 99 percent chance of a re-occupation of downtown Oakland's Frank Ogawa Plaza. But when Occupy Oakland returns to the open space in front of City Hall later today as promised, things will be a little different, according to the San Francisco Chronicle. First, while the Occupy Oakland Vigil Committee plans to make their camp a model of all Occupy protests nationwide and plans to occupy the plaza 24/7, it won't be a camp. Not per se: the committee says no sleeping or camping will be allowed. Instead, there will be around-the-clock demonstrations, sit-ins, and a constant "vigil," the newspaper reported. The protesters plan to move back in sometime Tuesday. Occupy Oakland followed the lead of Occupy Wall Street protesters in New York City's Zucotti Park and took over the plaza on Oct. 10. A police raid removed 100 tents on Oct. 25. The protesters returned, and police removed another glut of tents on Nov. 14. Since then, smaller camps near Lake Merritt and in a vacant lot have also been shut down. Occupy Oakland's been Mayor Jean Quan's albatross, the source of political discontent between her and the police union and her and the city council.